Remember those beautiful chanterelles I received? I had two good sized ones left, which left me with the dilemma of what to make. We both love grilled steaks with mushrooms, so it seemed only appropriate. This is a really good recipe for Sauteed Chanterelles. You can also use other mushrooms if you do not have access to chanterelles. The chanterelles are so flavorful that they really do not need too much added to them. I sauteed them simply with olive oil, thyme, a little shallot, garlic and then finished it off with butter. The perfect companion for these beautiful grass-fed steaks! These chanterelles would also be lovely on a piece of toasted baguette. Heat olive oil in a medium frying pan. Add the shallot and garlic, give a stir and cook for about 3minutes, to soften. Add chanterelles. Stir. Lower heat and cook until soft and golden, about 15 minutes. Stir on and off during this process. Add thyme and butter, stir. 7 Responses to "Sauteed Chanterelles"
Such a wonderful recipe! 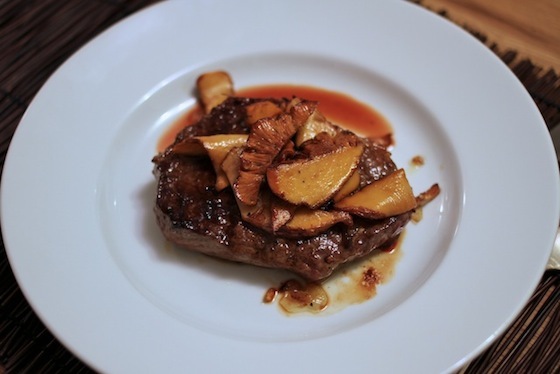 Chanterelles are by far my favorite mushrooms and steaks are my most favorite comfort food - this must a delicious combination :-) Thanks for sharing! I'd like that plate for myself, thank you very much! Looks fantastic! I love chanterelle mushrooms but they're more like luxury to us as Joey would say. I would love to have the whole plate. You're so lucky to have them fresh! I have only seen dried chanterelles and morels at the store recently. Chanterelles are the food of my childhood. My mom sautees them with potatoes which get nice and crispy. They are perfection will little more than butter, salt and pepper!